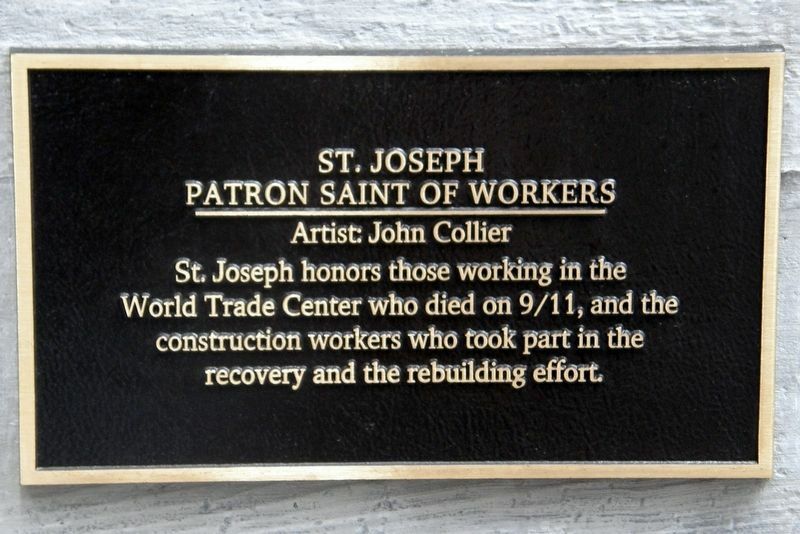 St. Joseph honors those working in the World Trade Center who died on 9/11, and the construction workers who took part in the recovery and the rebuilding effort. Location. 40° 42.755′ N, 74° 0.574′ W. Marker is in New York, New York, in New York County. 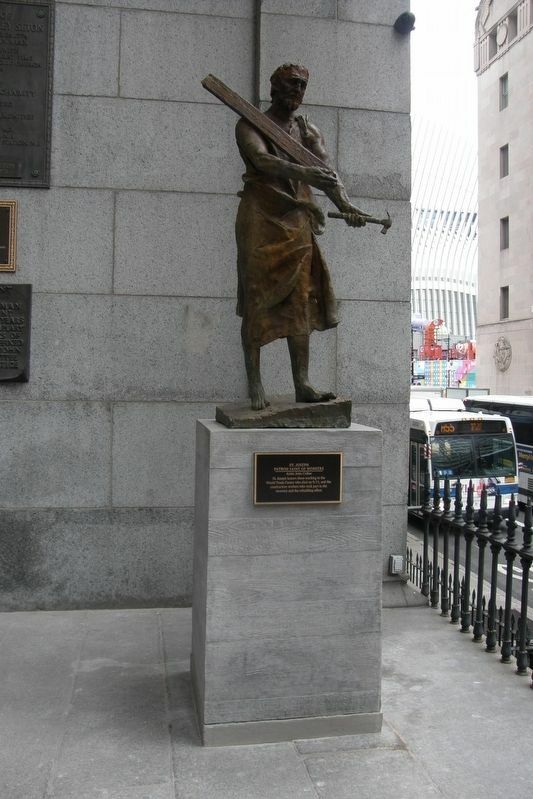 Marker is on Barclay Street. Touch for map. The marker is one of four in a series at Old St. Peter's Church. 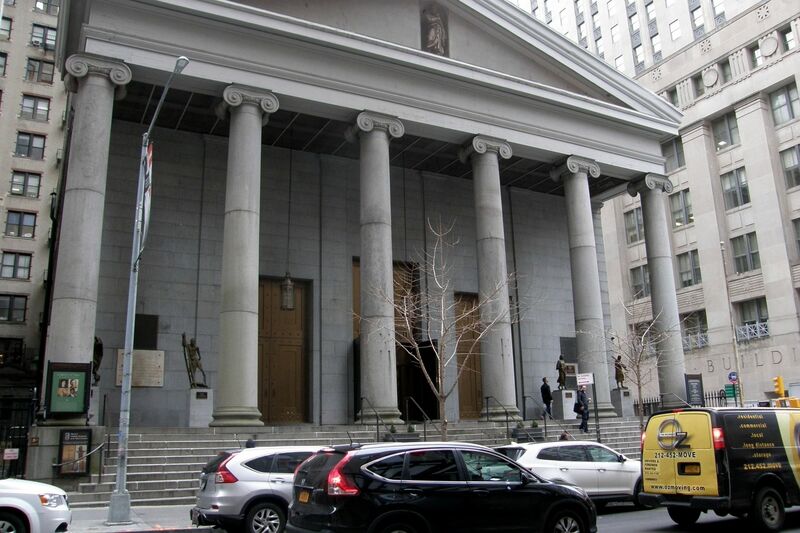 Marker is in this post office area: New York NY 10007, United States of America. Touch for directions. Other nearby markers. At least 8 other markers are within walking distance of this marker. 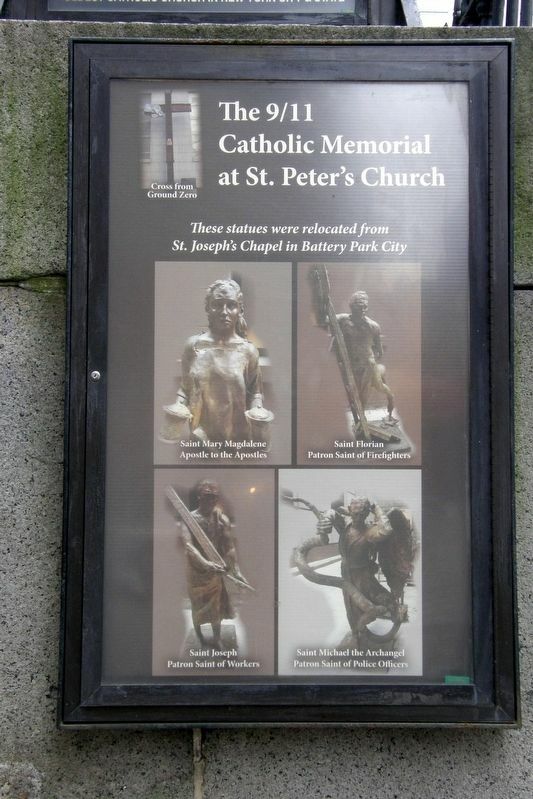 Old St. Peter’s Church (here, next to this marker); St. Mary Magdalene (here, next to this marker); St. Peter's Free School (here, next to this marker); Pierre Toussaint (here, next to this marker); In Memory of Elizabeth Ann Bayley Seaton (a few steps from this marker); The Cross at Ground Zero (was a few steps from this marker but has been reported permanently removed. ); 9/11 Cross (a few steps from this marker); Thomas J. McGrath Memorial Flagpole (a few steps from this marker). Touch for a list and map of all markers in New York. St. Joseph is to the far right. More. Search the internet for St. Joseph. Credits. This page was last revised on March 25, 2019. This page originally submitted on March 23, 2019, by Larry Gertner of New York, New York. This page has been viewed 45 times since then. Photos: 1, 2, 3, 4. submitted on March 23, 2019, by Larry Gertner of New York, New York. • Bill Pfingsten was the editor who published this page.